I will start off by saying, a movie starring Robert Downey Jr. will never get below 3 stars on this site. You get three stars just for casting my man, RDJ. 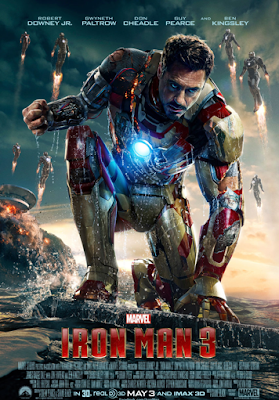 The third Iron Man movie takes place after the Avengers movie. Tony Stark (Robert Downey Jr.) is a messed up from the whole 'aliens and gods from a different planet' thing. New York, wormhole and aliens seem to be trigger words that set him off on full on panic attacks and he can't sleep at night. Weakness - hate it. There is no time for Tony to get over this latest mind blowing revelation, because a new villain is running around the world blowing things up. His friend and head of security, Happy Hogan (played by the director of Iron Man 1 and 2, Jon Favreau), is hospitalized during one of the explosions which sets him off and he decides to take matters into his own hands. Well, that's when it should begin. I don't think the story ever really picked up momentum for me. By the end I was like OK, wrap it up, things to do people to see...and then the end came and I stayed to see the still shots of RDJ. What was entertaining as hell was the Tony Stark one-liners. Superhero comedy at its best. Throughout it was magical, obviously, but the best ones were during the part of the film where Tony is stuck in Tennessee repairing his Iron Man suit. He enlists the help of a boy and proceeds to make fun of him...and nothing is sacred. I believe at my screening when Tony makes fun of the kid's dad leaving him the audience did the unison "Ooooo". It was pretty fantastic. Nothing is sacred to Tony - kids feelings? What are those? The action in the film was pretty standard. I quite enjoyed the Air Force One scene that I shall call "Monkeys in a Barrel" as well as the fight scene on the oil tanker - I can appreciate its visual greatness. Iron Man is still my favorite, but I think the entire franchise would have stopped after number one had it not been for Robert Downey Jr. The man carries these movies on his pinky like it is some side hobby he does on a Saturday. There are no cast members that came close to his greatness, but some tried. Don Cheadle as the Iron Patriot was decent to watch as was Jon Favreau as Happy Hogan. The ten year old boy Harley, played by Ty Simpkins, was just the right amount of irritating mixed with 'clearly an adult wrote your lines because no child is that insightful' that the kid portion of this movie was bearable. Gwyneth Paltrow was annoying as usual in the role of Pepper Pots, but that was to be expected. Guy Pearce and Ben Kingsley were complete let downs as villains. Rounding it all out was Paul Bettany as Jarvis, impeccable as usual. Should you go see Iron Man 3? Yes. Should you have high expectations? Seriously, of a THIRD installment? Get it together. They just want your money. Labels: FOR THE BOOK, Movie Reviews, Movies, Review, Robert Downey Jr.